Our Time’s Not Up was recorded at Ad Astra Recording, Williston, VT - Peter Engisch, engineer; mixed and mastered at Charles Eller Studios, Charlotte, VT. Lane Gibson, engineer, assisted by Pete Sutherland. Produced by Pete Sutherland. My humble musical tribute to the great Zimbabwean poet/folk-rocker Thomas Mapfumo. Obviously, I was fed up with the din of whining coming from my fellow 'citizens' the day I penned this call to arms! As a working artist–and having taken the usual accompanying vow of poverty–I and my family have been able to benefit to some extent from Vermont's generous healthcare access plans. We believe that everyone should have the same and better access to care. 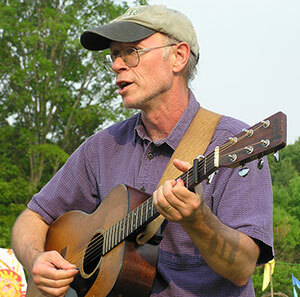 PETE SUTHERLAND is a native Vermonter, singer, songwriter, fiddling multi-instrumentalist and all-around community resource person of long-standing. His musical experiences on the local, national and international folk music scenes through decades of performing, touring, recording, presenting, studio production, and teaching at camps and festivals as well as leading workshops for all ages and abilities inform his organic approach to any music-making. From the get-go, Pete has been known for a highly personal style of roots music-based playing, always with a distinctive improvisatory flavor. In the spring of 2009 Pete was the Young Writer's Project's Artist in Residence in the Benson and Swanton schools for the Champlain Quadricentennial, and is a newly juried member of the Vermont Arts Council's Teaching Artists Roster. In addition to a varied performance schedule as an actively free-lancing member of the Northern New England music scene, he teaches music privately and at Middlebury College as an Affiliate Artist.